On Tuesday 17 November, 18 innovators pitched their new ideas for food-related products and services to members of the Open Innovation Forum – a group of senior executives from major food and FMCG firms, such as Mars, Unilever, General Mills, Tate & Lyle, Tesco and Crown Packaging. The OAL Group – for a new automated food processing system which produces high quality, ‘chef-standard’ food and does so much more quickly than existing processes, with less wastage and lower energy costs. Citrox BioSciences – for a range of innovative products and solutions that can extend the shelf-life of many food products such as soft fruit. GreenFood50 uses quinoa to make a range of tasty and healthy foods. Phynova ­– for making products from active compounds found in plants, including ‘functional’ food ingredients that reduce the risk of diseases and drugs that address common ailments. Jarrett Health – a health and wellness company which makes functional health drinks for women, children and the elderly. The remaining entrants included: Appy Food and Drinks, P Dawe Consulting, Ubisor, RedBite Solutions, McCarter, Freedom Meals, iQube Marketing, Level Cert, Zeet, SEPPIC, Fodmap Pty, Slalom and Trax Retail. The University of Cambridge Open Innovation Forum has been running for five years and was set up by IfM Education and Consultancy Services, the dissemination arm of the University of Cambridge Institute for Manufacturing, to provide support and opportunities for companies involved in the Food and FMCG value chain. To learn more about the OI Forum click here. Howard Thomas presenting his innovations for improving shelf-life to OI Forum members. A life-long scientist Howard was inspired through his observations of a local river system while on vacation in Spain. Jim Trueman with Pearl Jarrett of Jarrett Health, Highly Commended, and the unofficial winner of the most enthusiastic pitch of the day. 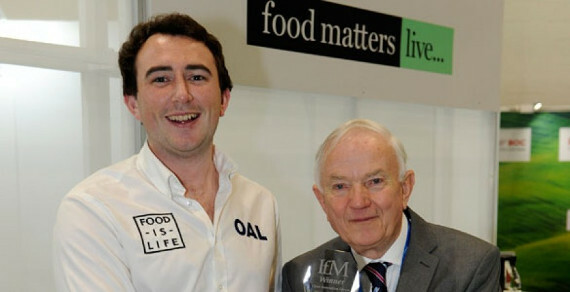 Marc Arts of GreenFood50, Highly Commended presented by Jim Trueman. Ivor Harrison of Phynova, Highly Commended. Peter Dawe of P Dawe Consulting making the case for commercialised reverse osmosis to produce drinking water.